Dinna Clerks, AKA Dinah Clerk – who or more technically what are they? 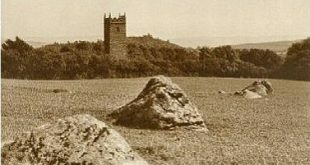 In all reality nothing to get too excited about, they are in fact the names of three fields belonging to or once belonged to West Shallowford which lies to the south-west of Widecombe-in-the-Moor. As can be seen from the 1843 Tithe Apportionment extract below the the group consisted of two arable fields covering 7 acres, 4 rods and 44 perches along with a pasture of 1 acre and 33 perches. However, what is of great interest is what lies in the northern corner of the arable field number 1609, for there sits the ruin of a deserted medieval longhouse which thanks to an archaeological excavation has yielded some fantastic treasures – OS Grid Ref. SX 692 751. Back in the 1960s the landowner of Dinna Clerk was clearing the land with a bulldozer in order to prepare it for cultivation. On this very day Mrs. E. M. Minter, a local archaeologist happened by and noticed the ruined walls. Her first thoughts were that the ruins may possibly be the remains of a longhouse and somehow managed to stop its destruction. She then undertook an archaeological excavation which initially revealed a 13th century stone longhouse, however; under the floor of the longhouse she discovered the remains of two superimposed turf-walled houses. She concluded that the later longhouse had virtually ‘echoed’ the same alignment as the turf houses. The longhouse was 16.76 metres in length with a tapering width from 4.26 metres to 3.35 metres. The design of the building was typical of a medieval longhouse and comprised of a byre where the livestock were normally kept, a living room where the hearth was located and a inner room as can be seen on the plan below. It was possible that there was evidence that the return walls were the base of a porch attached to the doorway. A drain was discovered running from the inner room which would have carried the run-off from the wall at the upper end of the house where the floor level lay under the ground surface. Mysteriously the sudden disappearance of the drain and the absence of a central drain suggested that at some point the floor level of the byre had been lowered down which may indicate that it was put to some other use rather than housing livestock. It was also evident that the longhouse had been destroyed by a fire which resulted in the turf roof falling inwards. Although the occupants may not have thought so this was a huge stroke of luck for modern man because the turf effectively sealed the structure and preserved the many artefacts underneath it. Once this layer had been removed further excavation revealed a ‘treasure trove’ of artefacts. In the living room the original granite hearth was found along with; four small cooking pots, a green glazed jug, a large cooking pot which was buried up to its rim in the floor, two charred wooden oak platters along with a heavy iron ring. In the case of the buried cooking pot it has been suggested that such utensils were commonly used for both culinary and medicinal fermentation purposes. In the south side of the room an assemblage of horseshoe nails, further iron rings and some pieces of iron and copper alloy were unearthed. In the inner room a pottery cistern was discovered as well as two yellow glazed jugs and a cooking pot. Again, recent studies into medieval pottery have concluded that such cisterns are commonly found in the West Country and were probably used for storing home brewed ale. It was concluded that these artefacts suggested that the inner room was used for both storage and as sleeping quarters. The byre yielded a well worn Long Cross silver penny dating to the time of Henry III which would place it between 1253 and 1260. As the coin came from a sealed context it would suggest that it was sometime between these years that the house was burnt down. As all these artefacts pointed to them belonging to a fairly affluent family and the very fact that they were still in the house suggests that the fire ravaged the place and the occupants fled in a hurry – never to return. It is the consensus of opinion that the majority of deserted medieval settlements on Dartmoor were abandoned as result of a deteriorating climate but in the case of Dinna Clerk the reason for its desertion is 100% proven – a disastrous fire. Sadly many of the artefacts found in the longhouse have been lost however some of them can be seen at The Royal Albert Memorial Museum in Exeter and on their online website. For me the question is; “who was Dinna/Dinah Clerk? Could it be that at one time she was a local woman who either owned or leased the fields and therefore they adopted her name? Additionally how did the fire start? Could a spark from the cooking house have set alight to the turf roof or maybe it was a malicious act of some kind? One other find which has been discovered at Dinna Clerks was what has been described as; “a pierced stone object found in the roots of a bush.” The object was made from micaceous sandstone and measured 45 mm. long, 10 mm. wide and 3-5 mm. thick with a hole at either end and it has been suggested the object resembled a prehistoric archer’s wrist guard. Heritage Gateway No. MDV12958. Although there is an assortment of prehistoric cairns and hut circles in the vicinity of Dinna Clerks sadly no connection can be made with this artefact. Please note that the site is actually on private land although access is normally granted.